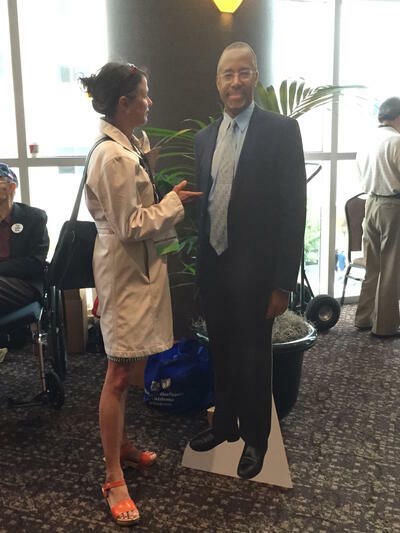 Nina Burleigh (interviewing cardboard HUD Secretary Ben Carson above) is an award-winning author, journalist and feminist cultural critic who covers politics for Newsweek. She is a New York Times best-selling author of six lively, acclaimed works of creative nonfiction. Her latest book, on Trump and women, published in October 2018, is an acid romp through the world of the branded and commodified Trump female. Burleigh got her start covering the Illinois Statehouse in Springfield, where the governorship included a fitting for the prison stripes. She has written hundreds of works of journalism, essays and book reviews, on a wide array of topics including culture, politics, gender issues, science, and the environment. Two of her magazine articles were made into dramatic productions. Many of her books explore the tension between belief and science, religion and rationality in post-Enlightenment life, including 1830s American politics, among post-revolutionary French scientists in Egypt, Cold War era CIA conspiracy theories, fake Biblical archaeology in Jerusalem today, and the role of faith versus science in an Italian courtroom. Two of her books examine the relationship between art, nature, history, and science. In Mirage, she told the story of the scientists and artists behind the first great study of modern Islam and ancient Egypt, Description de l'Egypte, a landmark work of art and publishing produced by the scientists who went to Egypt with Napoleon in 1800. Her book Unholy Business is a Maltese Falcon style crime caper about a gang of forgers accused of applying new technology to alter and sell archaeological relics. A fellow of the Explorers Club, she has covered stories on six continents. She has published works about the Arctic and the Antarctic, the Amazon, where she wrote an essay about women, nature, and the human culture along the Amazon River in Peru and ayahuasca culture in Iquitos, posh Lagos, racism and rhino poaching in South Africa. She has written cover stories for Newsweek on Trump and Women, Trump as a tool of the New York billionaires, Trump and Evangelicals, Trump and the Law, Facebook and political big data mining, the #metoo movement, the melting of Antarctica, sea level rise in Florida, asteroid defense schemes and other current events. She has judged the J. Anthony Lukas Prize Project Awards for nonfiction, and won several awards for her journalism and books. She was writer in residence at the Siena Art Institute in 2013 attached to the Above/Below Ground project with Mark Dion and Amy Yoes, including a symposium on the Art and Science of The Expedition. She was a Dora Maar Fellow in the arts in Menerbes, France, in 2014, where she worked on a novel. Mirage was selected by The New York Times as an editors' choice and won the Society of Women Educators' Award. Her writing has appeared in numerous publications including Rolling Stone, The New Yorker, Time, New York, The New York Times, Slate and Bustle. She has appeared on Good Morning America, Nightline, The Today Show, 48 Hours, MSNBC, CNN and C-Span, on NPR and numerous radio programs. Nina was born and educated in the Midwest, has been based in Washington, D.C., New York, and Paris, and has traveled and reported extensively in the Middle East and lived in Italy and France. She has been an adjunct professor at Columbia Graduate School of Journalism and has lectured around the United States, in Italy, and in Mexico. Her latest book, Golden Handcuffs: The Secret History of Trump's Women, has been covered in The New York Times, New York Post, Entertainment Tonight, BBC, MSNBC, Yahoo and many other media outlets. 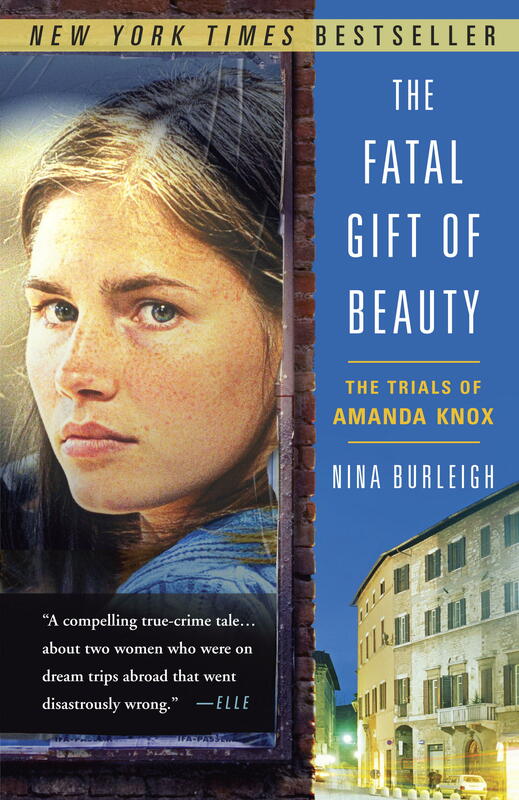 Reviews for The Fatal Gift of Beauty: The Italian Trials of Amanda Knox. Clockwise from top: Golden Handcuffs, Unholy Business, Mirage, The Fatal Gift of Beauty, A Very Private Woman, The Stranger and the Statesman.